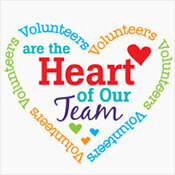 April is National Volunteer Appreciation Month! The Glenview New Church is strengthened by its volunteer participation and we appreciate all that you do to enhance our church community! Here are just a few of the many jobs our volunteers help with: Sunday morning service volunteers, music teams, usher’s, greeters, REFRESHMENTS! !, Festival Services, tableaux and pageants, youth programs, Sunday School teachers, work parties, board and committee members, hospitality, fundraising groups and so much more – you do it ALL, all year long! Your efforts contribute so much to the life of our church and community. As a small token of our appreciation we will enjoy cake and goodies between the services today. Please join us to celebrate our year and express our gratitude to all of our Glenview New Church Volunteers. Thank you for your support!